IKEA is one of the best-recognized furniture brands all over the world. It appeals to a young and hip audience, as it makes affordable furniture and home furnishing choices that are especially favored by those just starting out on their own. If you're looking for high quality, heirloom furniture, you will need to consider other brands as you shop around, but IKEA furniture is certainly affordable, attractive and provides the opportunity to be creative. You can buy unfinished furniture, or even mix and match parts to create your own customized furniture. The brand is so popular that an entire industry has developed around DIYs and hacks of IKEA products in an effort to help you customize your furniture even more. For all its youthful appearance, IKEA is not a newcomer to the industry. The company started out in 1943 in a small village called Agunnaryd in Sweden. IKEA's founder Ingvar Kamprad was only 17 at the time. The first two letters in IKEA come from the initials of the founder's name, the next two from Elmtaryd, the farm that he grew up on, and Agunnaryd, his village. IKEA originally sold accessories and knickknacks at bargain prices but began selling furniture in the late 1940s. Today the company has grown into a major international furniture and home furnishings brand operating across the world. There are around 340 stores in 28 countries that stock home furnishings and furniture for the entire home under one roof. Easily recognizable by their blue and yellow logo, most IKEA stores are company owned, but there are a number of franchised stores as well. New introductions and perennial favorites are featured in IKEA catalogs that are eagerly anticipated every year. IKEA has been referred to as the "quintessential cult brand" by BusinessWeek, and the British design magazine Icon voted Ingvar Kamprad as the most influential tastemaker in the world. There is something to be said about affordable furniture that is also attractive. It is possible to furnish an entire home from top to bottom for a comparatively modest amount. That is not to say that their furniture does not have other uses. Even well-known designers such as Lori Dennis throw an IKEA piece in the mix when designing an interior. Lighting, rugs, bedding, textiles, and accessories are also available to complement any furniture purchase. There are also plenty of efficient storage solutions for the entire home. IKEA has much to offer for small spaces. For bargain hunters, there is an "As-Is" section in most IKEA stores, where you can get bargain-priced furniture that has suffered varying degrees of damage from imperceptible to bashed in drawers. There are lots of choices for all the rooms in a home: dining furniture, living room furniture, home office furniture, and furniture for children's rooms is available at different price points and quality. The furniture is relatively easy to assemble, and you can even find pieces that don't require tools for assembly. Efficient packaging makes it easy to transport. IKEA is also paying more attention to sustainability and making their products greener. For instance, the brand has banned PVC from its products, and reduced formaldehyde from lacquers and glues. The company is also using and looking to increase the use of new and sustainable materials. The Poang armchair has a layered and glued bentwood frame of birch. The chairs have enough give to make them comfortable. The cushions are available in fabric or leather. The Lack series, with side tables and coffee tables which come in many different finishes, have also been popular through the years. Billy bookcases which come in many sizes and finishes. The Beddinge Lovas sofa bed is around $199. It is possible to buy a complete bedroom for under $450. When you shop at IKEA, you should not expect to find heirloom quality furniture. While most of the products are certainly affordable, longevity is not typically a common attribute. Very often affordability and quality do not go hand in hand unless you are buying used furniture. Certainly, IKEA is not the only brand that sells affordable but lesser quality furniture. Largely made from particleboard, IKEA furniture most often does not stand up to years of use. Disassembling and transporting the furniture during a move can also shorten its lifespan. And while IKEA has done much to address environmental concerns regarding the toxicity of its furniture materials, to call it entirely green is a stretch simply because it lacks one very important feature of green furniture – durability. That is especially true of the more affordable furniture at IKEA. An IKEA store is hard to miss with its distinctive blue and yellow coloring and sheer size. A single store carries everything you need to furnish a home: from furniture to kitchen cabinets, to lighting, down to brushes for washing dishes. Since IKEA stores strive to present the same shopping experience at all their locations, you can maintain a single strategy for shopping at any IKEA. You can find a lot of information about their products, including dimensions, colors, prices, and availability at your local store. This allows you to decide beforehand what you will be buying once you get there. If you show up without making plans, you can spend an eternity in their labyrinthine showrooms. Once inside, you can spend a lot of time just looking around without being bothered. The displays make it easy for customers to visualize using the products and almost everything that you see there is for sale within the store. Customers have access to measuring tapes, pencils and notepads to jot down information, including the aisle number and shelf number, which makes it easier to locate their furniture in the self-serve warehouse. You can purchase the furniture and take it home with you right away. If you prefer, it can also be delivered, but make sure to check out delivery charges. 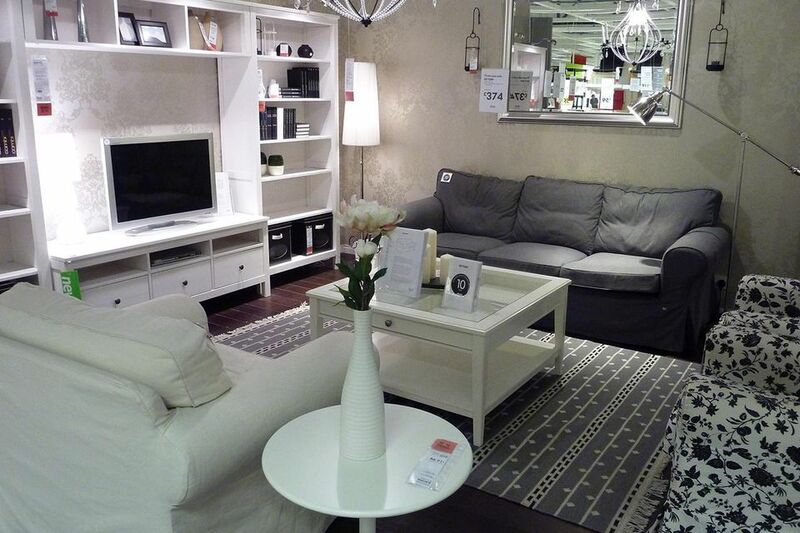 To find an IKEA store close to you, visit the IKEA Store Locator. If there is no IKEA store in your vicinity, you can shop online. Remember: IKEA provides reasonably priced attractive furniture for someone who is just starting out. It gives you a chance to explore your preferences, especially when you are not ready to invest in something of outstanding quality just yet. Is Lane Furniture a Good Fit for You?